Remember that this month’s Membership Meeting is not next Monday, the 16th. It has been moved to April 23. 5:00 p.m. at Local 1092. Q. Why isn’t there Overtime on the check? A. If you worked Overtime during your retroactive period, retro pay for Overtime should be on your check. Regular pay is called “Retro Pay Pen” on your check. Overtime pay is called “Retro Pay No Pen” on your check. Look for both amounts. Q. What time period does the retro check cover? A. If you are in a prevailing rate position (Apprentice, Construction Laborer, ECD, Subforeman, etc. ), you were owed a raise on July 1, 2017 that you did not get. So your check covers the period from 7/1/17-2/1/18. If you are in a non-prevailing rate position (District Clerk, Watchman, Safety Specialist, etc.) you were owed a raise on January 1, 2018 that you did not get. So your check covers the period from 1/1/18-2/1/18. Chicago’s Department of Aviation will be posting a bid for 1 Stores Laborers tomorrow. The job is at O’Hare in the warehouse there. You must apply online at the City’s website. You MUST read and follow all instructions on the bid or it will be rejected by the City. If you would like assistance submitting your bid, please call us and set up a time to come in and meet with Phillis. Good luck. Also- Today, Cook County put up a posting for 1 Laborer in the Facilities Department. You can find that posting here. As with City postings, remember to follow all instructions and call us with questions. Chicago’s Department of Fleet and Facility Management (2FM) will be posting a bid for 3 Laborers tomorrow. You must apply online at the City’s website. You MUST read and follow all instructions on the bid or it will be rejected by the City. If you would like assistance submitting your bid, please call us and set up a time to come in and meet with Phillis. Good luck. Additionally, we have JB Pritzker and Kwame Raoul yard signs at the hall. Please stop by and pick one (or more) up. Worker Rights Rally this Saturday! The time is NOW! The future of your job, your Union and the Middle Class is at stake. This coming Monday, the U.S. Supreme Court will hear arguments in a case that may significantly harm the future of your union rights. Now more than ever we must stand together. 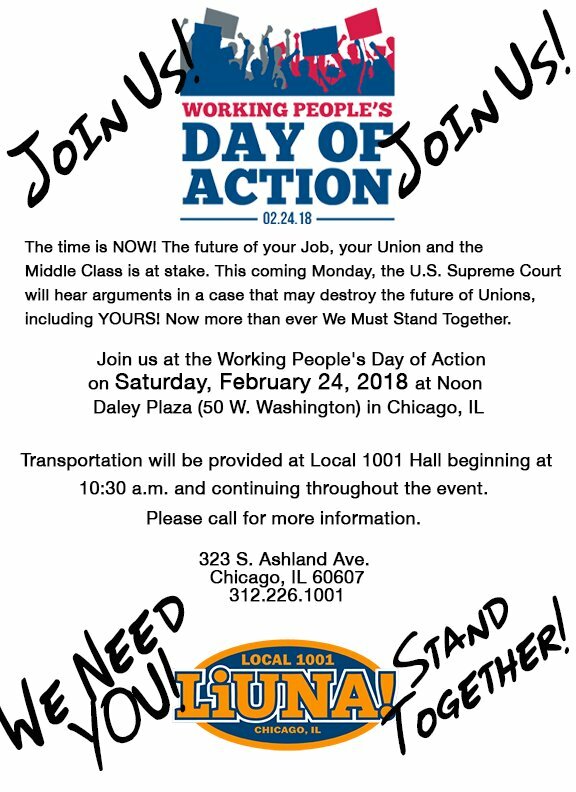 This Saturday, February 24, please join us for a Working People’s Day of Action. Noon at Daley Plaza downtown. See more details here. Come out and stand up for your rights! And stop by the hall this week if you don’t have any LiUNA gear and you need an orange t-shirt. Thanks to all of you who responded to the text message we sent this week about volunteering this weekend. We need even more people- if you didn’t respond to the text please call the hall and let us know you’ll come out for a couple hours either Saturday or Sunday. There are 5 locations all across the city, and more in nearby suburbs. We’ll get you the location closest to your house. I’ll be at the Diversey location Saturday morning. We need to get out there and help the Pritzker/Stratton campaign. No other team will work to protect our jobs, wages, and pensions like they will. Our strength as a union comes from our ability to unite to effect change for the better- a great opportunity to do that is this weekend. JB Pritzker’s campaign is having two weekends of action, January 27th & 28th and February 17th and 18th. They need volunteers at all their campaign offices. Getting Pritzker elected is key to holding on to our rights and benefits as Laborers, and key to making sure the infrastructure work that is the basis of our livelihood continues in the future. Please do all you can to get out and help the campaign on at least one of these dates. You can choose any date, any location, and any shift. Please call the hall and let us know which one you’ll be at. We need to get out there and help him get elected.